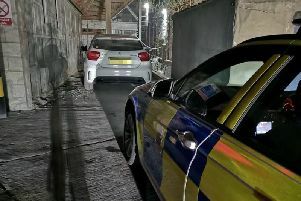 A drink-driver was tracked down after his car registration plate was found at the scene of a collision with another vehicle. Chesterfield magistrates’ court heard on Tuesday, January 10, how Craig Haywood, 38, of Lime Avenue, Staveley, was found to be more than twice the legal drink-drive limit an hour-and-a-half after the collision on Bond Street, Chesterfield. Prosecuting solicitor John Cooper explained that the defendant’s vehicle had struck another vehicle which suffered damage to a bumper and the rear driver’s side wheel arch. Mr Cooper added that a registration plate was discovered at the scene and Haywood’s vehicle was traced and was found to missing its bumper. Haywood pleaded guilty to exceeding the alcohol drink-drive limit after he registered 84 microgrammes of alcohol in 100 millilitres of breath when the legal limit is 35 microgrammes. Mr Cooper said he gave the drink-drive reading an hour-and-a-half after the collision on December 22, 2016. Magistrates fined Haywood £320 and ordered him to pay £85 costs and a £32 victim surcharge. He was also disqualified from driving for 22 months but if he completes a drink-drive rehabilitation course his ban could be reduced by 24 weeks.